Coming soon, my newly redesigned "Event Console" - a product designed for people who want their web site events calendar to remain largely independent of mainstream social media tools. Oh, and independent of any tardy, hired web-head who's in charge of your site updates of course. It doesn't matter how tired or static your web site has become, with this nifty little tool your web site will always look like it's up to date! You can even update your web site calendar from your phone whilst lying prone in a gutter after closing time. 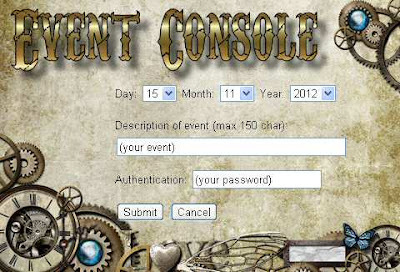 Ignore the "Steampunk" console imagery (sample input screen shown here). The output is pure text streamed directly into your web site and formatted according to your own style sheet. I have two clients working in Beta for several months now, and nothing's broken. Want some? Want a shiny nickel plate finish?